Sadly, there was no "threepeat" for Emma this year....But she came home happy...Emma closed out her last Eukanuba Junior year placing 2nd in the finals and was awarded $1500 scholarship. That makes a total of $10,500 in scholarships awarded to her in the past four years. Emma has been a terrific Junior, and I am sure one of the best the program has seen. 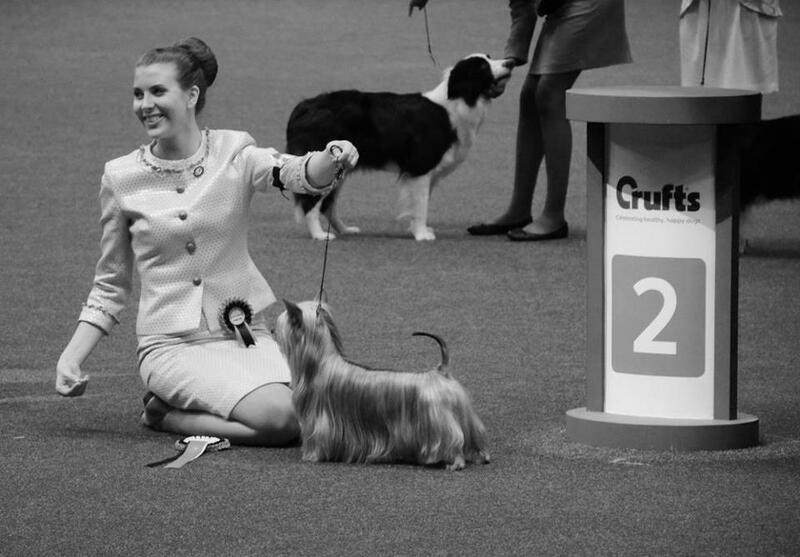 Below are some photo's of her in the finals with her dog Tucker. We can't be more thrilled here at Shirebourne. Congratulations, Emma! 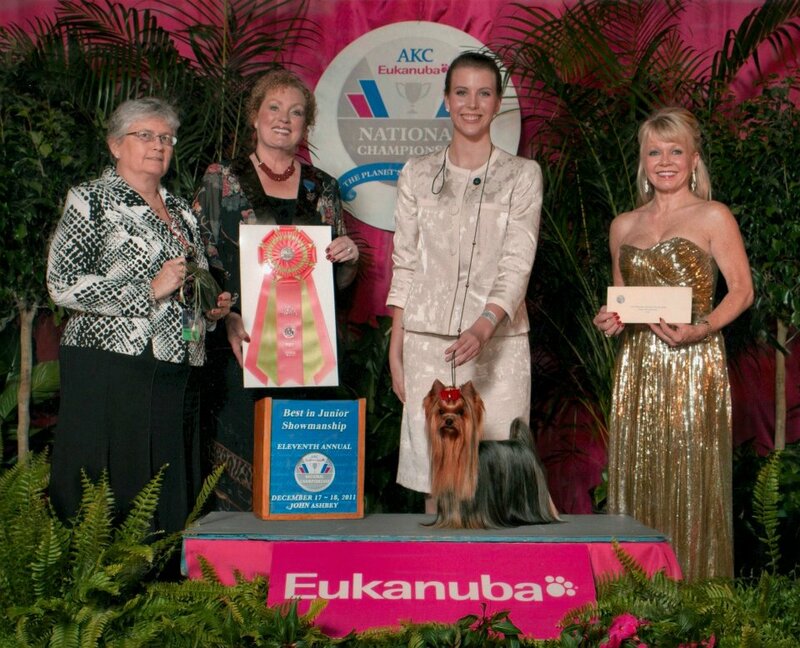 Emma takes 2nd place in the AKC Eukanuba Juniorshowmanship Finals on Dec, 14, 2013. United Kennel Clubs "Crufts" Dog Show 2013....Emma took 2nd place at the International Jr Handling Championship at Crufts, Birmingham, England on March 9, 2013. Thirty nine countries competing...She made us all proud...Way to go, Emma!!! She did it again!!!! 2012 Eukanuba National Best in Show Junior Showmanship Winner. 2012 Eukanuba Best in Show Junior Handler Winner. EMMA DID IT AGAIN..... She is the 2012 AKC Eukanuba Best in Show Junior Handler for the second year in a row. 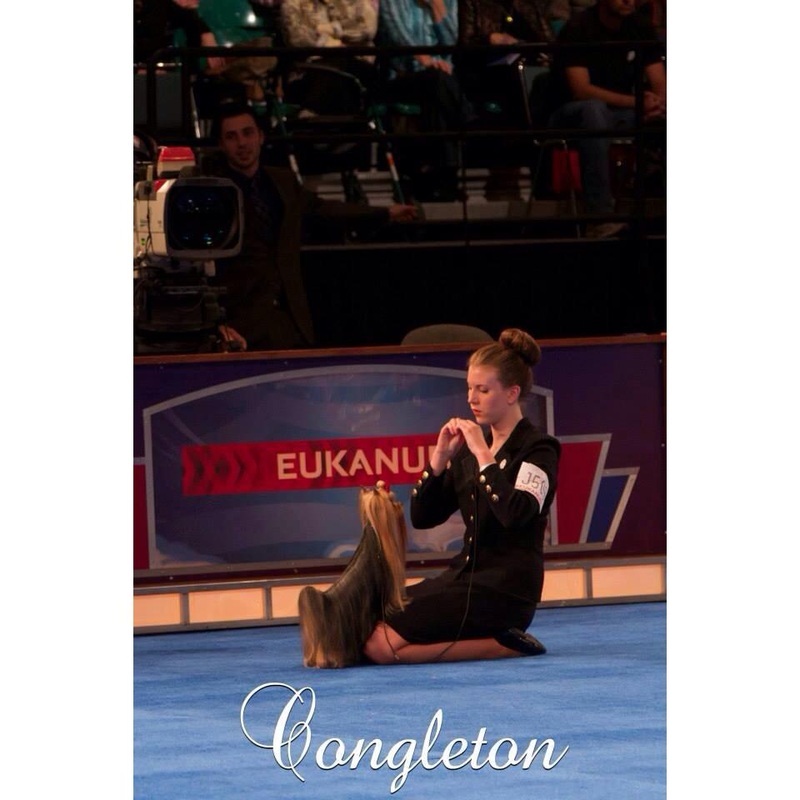 Competing against 166 other Junior Handlers from all over the USA she made us all proud here in Atlanta. Emma has made history both with a Toy Breed, and back to back wins. Another $2,000 scholarship, and qualified to compete at Crufts again! 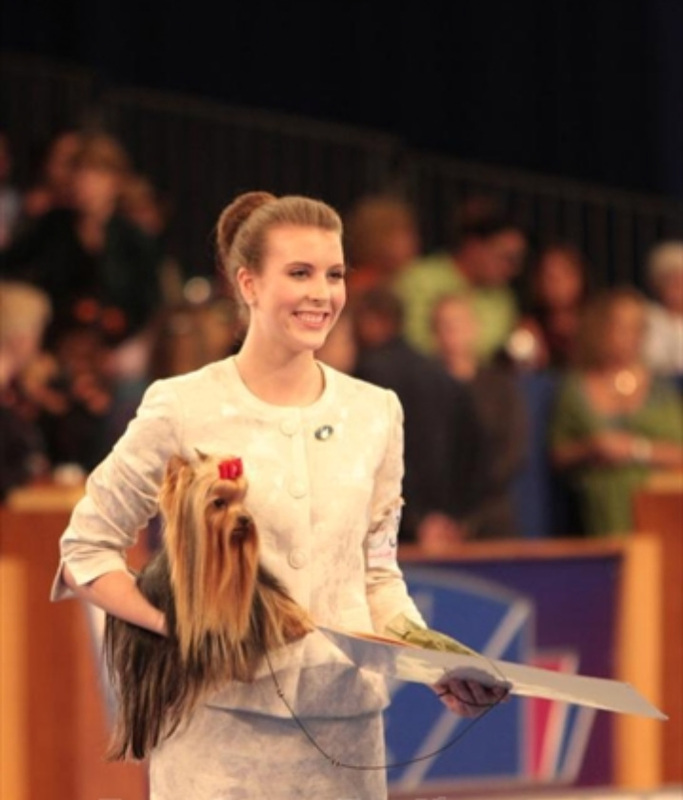 Emma will now represent the USA at The Crufts International Junior Handling Championships in Birmingham, England on March 9, 2013. December 17, 2011....Orlando Florida....Beautiful Photo of Emma and Tucker taking the "First Place" win at The Eukanuba Best Junior Championship 2011. $2,000 scholarship. First time in history win for a Junior with a Toy Breed. Thank you to Judge Mrs. Kimberly Meredith-Cavanna from California. 2011 Eukanuba Best in Show Junior Handler Winner. 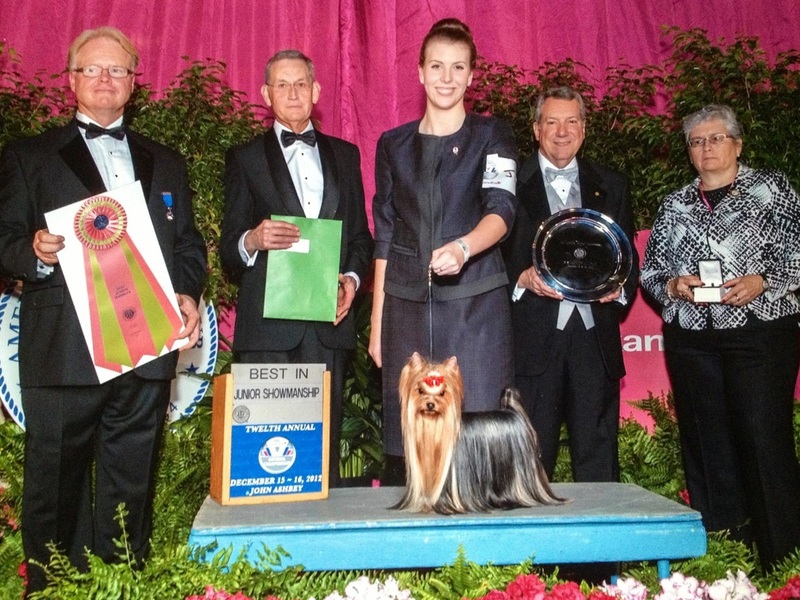 Emma takes the Big Win at the 2011 Eukanuba Best Junior Showmanship. Eukanuba 2009...Emma and Lance top three in the semi-finals. Another photo of Top Twelve 2009 Eukanuba National Junior Showmanship Finals. Junior Showmanship UPDATE......Emma attended the 2011 AKC Junior Showmanship Challenge in June in Oklahoma City, and was awarded 2nd Runner Up to receive a $1500 College Scholarship with Tucker. She also took two back to back Best of Breed wins in Conformation. Emma take Best Junior Handler at Greenville Kennel Club 2009. There were 98 other Juniors vying for this win. Tucker takes Second in Puppy Sweeps two days in a row at YTCA Specialty, Olive Branch MS.